Here are some of my "miscellaneous" markers. 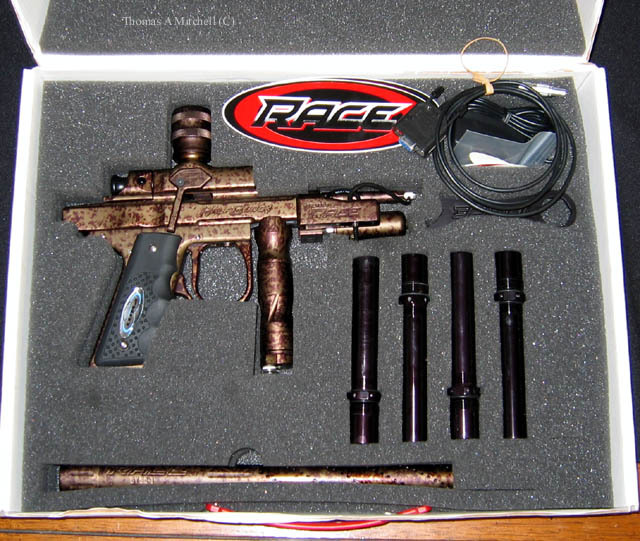 Some interesting ones here - ones that may not have had a long run (Demonic's), Prototypes (PBX Autorocker), or were special runs of a normal production line (Racegun halfblock). 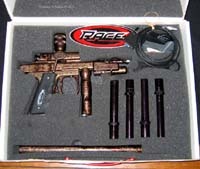 2005 Racegun Halfblock. Ok, for a while I started the list with the zebra Westwood, but I think perhaps I have found a gun to drop it down a notch. A 1 of 3 camo anno'd Racegun halfblock. 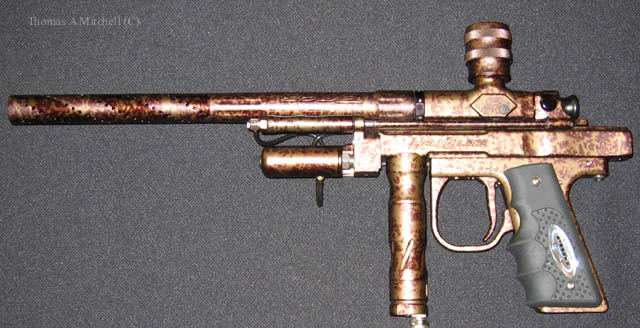 Maybe not a rare as the Westwood, but an uber sweet marker that shoots as well or better than anything else I own. I was surprised when I got this just how much milling is on the body. This thing is seriously light! And it is one of the few half blocks that doesn't have the sled touching the body. The other thing I like about this is the SM1 barrel kit. I think it is really slick how they did a dust/polish spiral on the barrel. I believe the SM1 was made by Sanchez Machines - and Smart Parts had them shut down for infringing on their Freak patents. Definitely the near the tops of my collection so far with respect to playability and sheer speed. As for specs, it has dual nylon détentes, a delrin bolt, clamping feed neck, CCM ram, Palmers micro rock, and Gladiator reg. Racegun really did a good job with attention to detail on these things, everything goes together like a champ. The only things I've added were a black CP on/off, and a black QEV/TRV combo on the ram. 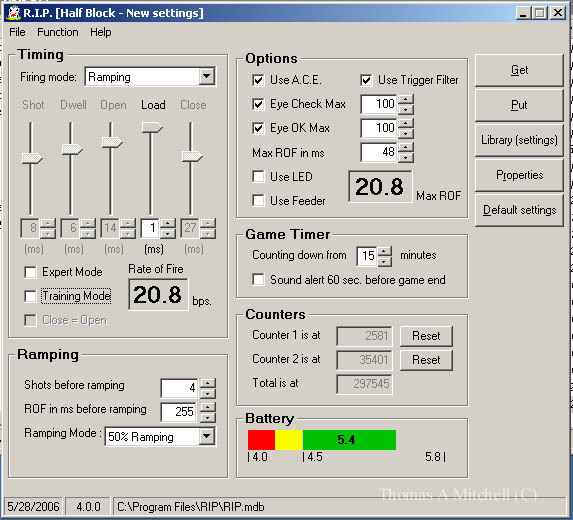 I'm still tuning the settings as well, but it is running the latest ramping software. I did, btw, put an MQ valve in here for a little while, but I heard of people breaking their half block pump arms and such and so I took it out (though I suspect those issues were only loosely related to the MQ). It works great in "mech" mode so why complicate it and risk breaking parts (especially parts that are match anno'd)? 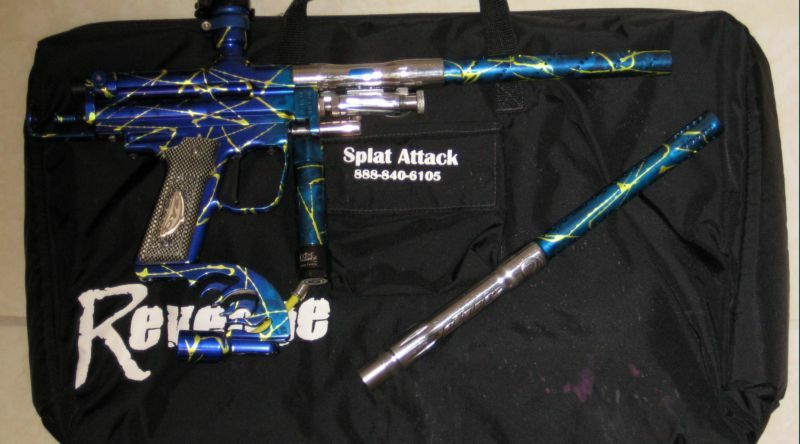 Splatt Attack Revenge V2LE annoed blue to light blue fade with yellow splash. I love this marker - and I had been looking for one of these for a while. 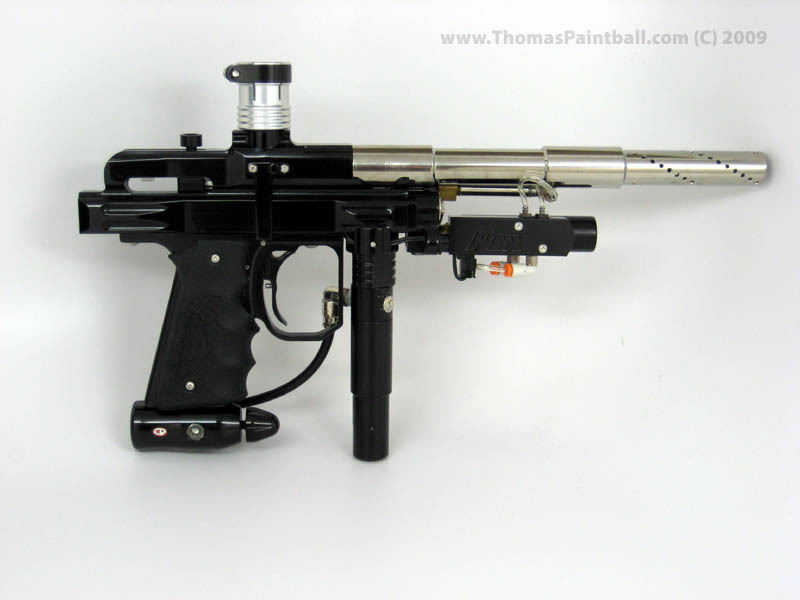 I actually had bid on this marker about 3 years prior, but I think insulted the seller with my bid and lost out. Just recently it came back up for sale, and I jumped on it at a bit higher price than my original offer (live and learn). 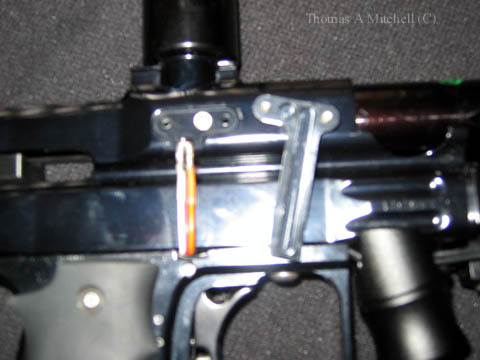 It's great because it has a hinge trigger frame (sliders are nice, but I prefer hinge), and all sorts of match annoed components including both a freak tip and a boomstick tip. A couple things that make the revenge LE line rock: the 3 way is inline with the trigger, so there is a smoother pull and no kinking, ultra light milling, and all AKA internals including a merlin sized AKA tornado valve - so this puppy runs at very low pressure. Really happy to pick this one up. I've also added a trinity T-lock feedneck to it - a cool item that is out of production but I have managed to pickup and put on most of my vert feed markers that didn't have clamping feednecks stock. 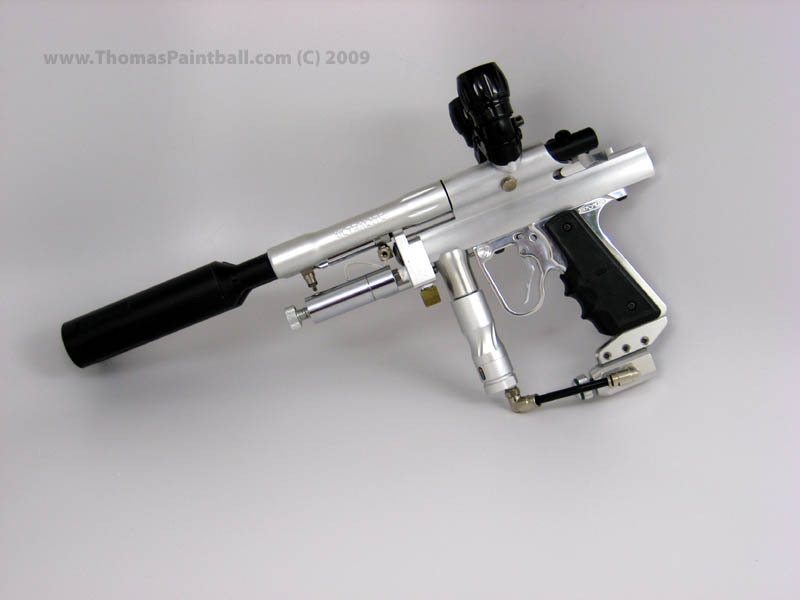 This one also now has a White Wolf boom stick style freak back instead of the stainless back. 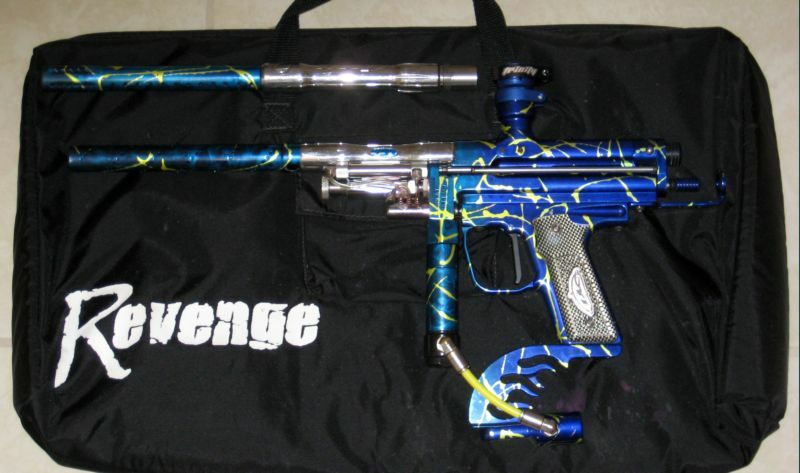 As mentioned, this bad boy was based on a true WGP body with an eblade style MQ valve as the "guts." 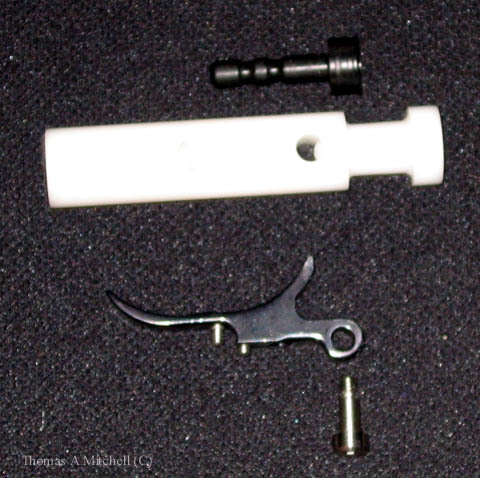 The entire cocking mass was ~25 grams, with an ultra light delrin bolt and pull pin (even the bolt retainer is delrin - cool!) and tiny delrin sled. For maximum speed, they used an small bore ANS/Clippard miniram with QEV's. It runs at a slightly higher pressure than a Nexus ram, but it is faster. The milling is conservative but looks nice, but at the end of the day the trigger frame is where the magic is. It is a timmy (!) 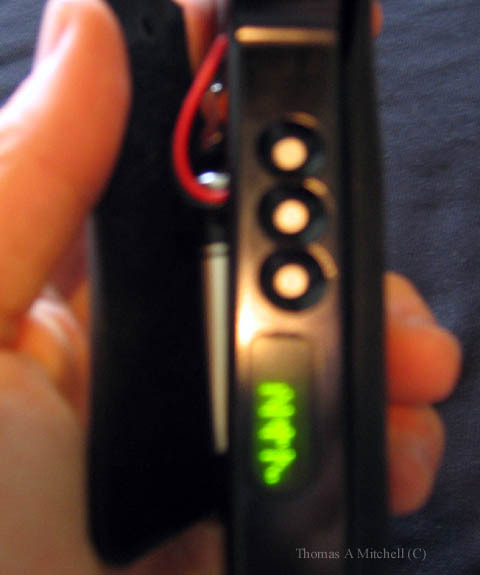 style trigger pushing on a 25g microswitch. Since there is no solenoid issues with the MQ valve, they could fit a much smaller board run off a 9volt and even implement wrap around 45 grips (awesome). It also supports beam break or reflective eyes. 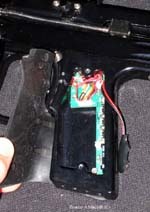 On this one, they used beam break eyes that are very similar to Racegun's in the way that the eye covers hold down dual delrin detents and springs. As far as interface goes, it uses a very eblade like green LED screen and three button interface. Here is a link to the frame manual put out be the original inventor: http://www.kajohnson.com/files/frameman.pdf. Shooting the marker is very impressive - true to marketing claims, there is almost ZERO kick. The marker just doesn't move at all. And the trigger feel is fantastic. Since this is a prototype, it also has full auto available (but no ramping), but I haven't played with that yet. Other thing that is interesting - apparently there was a manufacturing error on the first batch, that resulted in the geometry between the ram an sled being off. Because of this on my autorocker they had to use a stainless (heavier) pump arm and lock it into the sled with pins. Lately I've picked up a clamping feedneck, a Deadlywind carbon fiber barrel, and a Palmers Stabilizer for it. I'm also going to put an MQ2 in soon. Its really a shame this never got widely distributed - its a great marker with lots of potential. I actually bought a second of the kits and then sold it. KPCS MaDeuceA2. A one of 5 custom C&C milled half block dual barrel autocockers made by Ken at www.kpcspb.com. I stopped my nasty typhoon project and sold it when I heard these were coming out - and this will end up being the most expensive cocker in my collection. I've got plans to set it up with a Gemini 6 way and Centerflag hyperframe to run it semi without worrying about it chopping. It will also likely have a Palmers Reg (2) and an Eclipse Nexus ram with QEV's. I'm also considering having it milled to merlin valve specs and using a merlin tornado valve. Hmm... stay tuned - this one should be interesting. 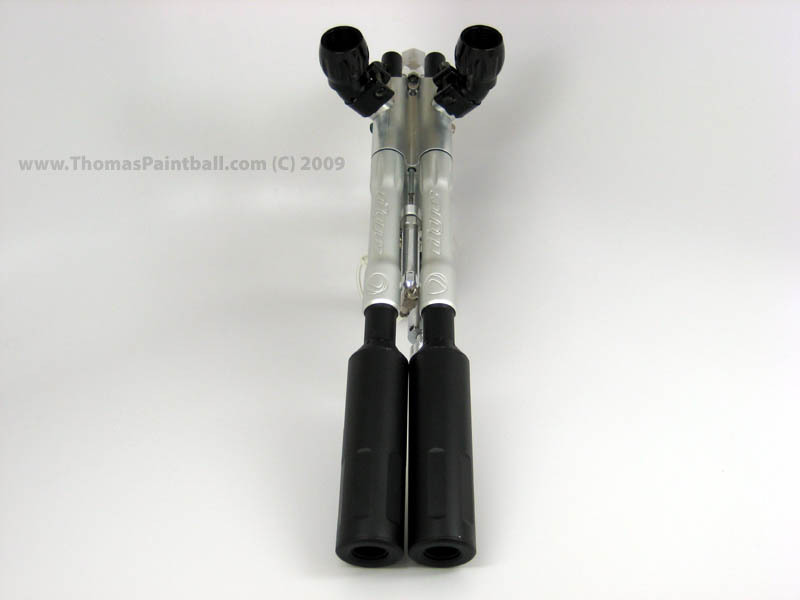 Pictured with dual Carter Machine ultralight barrel tips. CCM Series 5. I love the clean lines on this marker - which was made by the same folks that milled the Works autocockers. Definitely a less is more look. They are also super smooth to shoot, and not very hard to track down for not too much money.